View of an the extensive three-storied building known as Gyume Dratsang part of Gyume monastery surrounded by a wall and with an entrance gateway and an insense burner (bsang khang). There is a sentry box beside the gateway and a prayer-flag pole in the centre of the picture. The photograph is taken from the roof or window of Ringang's house which is also surrounded by a wall with a gate. There are willow trees in the centre of the photograph. Notes on print/mount - "Street from Ringaan's House" written in blue ink on the reverse of the print. Other Information - Historical Background: "Gyume has been active as a religious institution since the middle of the 15th century. The Tantric colleges were founded in the 15th century by one of Tsongkhapa'a famus disciples in order to train novices. 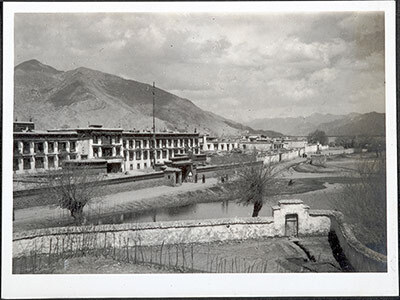 Gyume Dratsang became a major religious institution in Lhasa ranked after Ganden, Depung and Sera, and only monks from these monasteries were admitted. In the 1940s, Gyume Dratsang housed 500 monks and owned 28 estates, six small monasteries and five sub-colleges. Its summer retreat was located 200 kilometres from Lhasa." The Lhasa Atlas , Knud Larsen and Amund Sinding-Larsen, London: Serindia Publications, p. 140. The Tibet Album. "The Gyume Dratsang building in Lhasa" 05 Dec. 2006. The Pitt Rivers Museum. <http://tibet.prm.ox.ac.uk/photo_1999.23.1.21.2.html>.